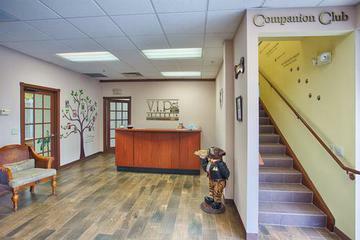 Orlando's Exclusive "Companion Club�" Located on the 2nd floor at the V.I.Pet Resort Orlando! The Companion Club™ is Orlando's Exclusive Club™ for small dog breeds only! 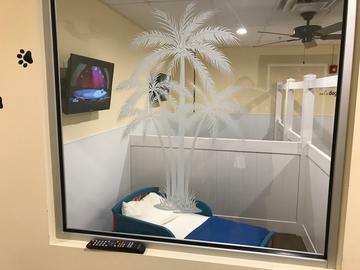 Our beautiful Deluxe Suites and Deluxe Villas are located at the V.I.Pet Resort Orlando on the 2nd floor. We only accept breeds 25 lbs. and under in this area so your little one will feel comfortable with friends of the same size. This all-inclusive luxury pet resort will make your little prince or princess feel like royalty! The Companion Club™ features extra large Deluxe Suites and Deluxe Villas, private TV's featuring the Disney Channel, comfy bedding with pillows and blankes, meals prepared like home, fresh water always, daily specialty treat item (a different treat each day of the week), group playtime at Poconuts Beach Club, bone-shaped pool and pool deck, pint-sized lounge chairs for relaxing poolside, bedtime snacks and plenty of love and attention from caring staff! The Companion Club™ also features Luxury Deluxe Villas complete with toddler bed and all of the above. Our entire facility is immaculately clean, beautifully decorated, air-conditioned, safe, and secure! Feel free to come by for a tour anytime during our open hours! We have an "Open Door Policy" - no appointment needed!